DETAILS FOR Sounds Set To Host New Event on Friday, May 2nd! Sounds Set To Host New Event on Friday, May 2nd! Comments Off on Sounds Set To Host New Event on Friday, May 2nd! 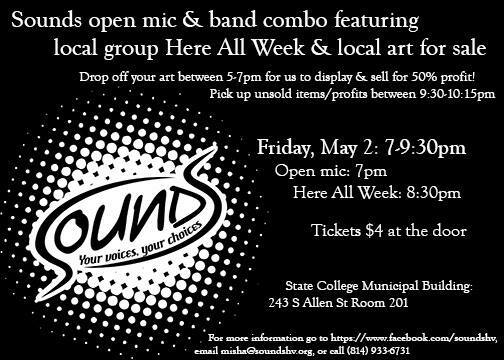 Sounds‘ next event will be a combination open mic and band showcase on Friday, May 2nd in the Community Room (Room 201) of the State College Municipal Building. For the first hour and a half, musicians will be invited to perform for 5-10 minutes in a friendly and welcoming atmosphere. Then, stay and enjoy some great music with local band Here All Week! We’ll also be featuring art for sale: whether it’s jewelry, wearables or colorful prints, it’s all local and affordable. Visual ARTISTS-Please submit your art by bringing it to the Community Room between 5-7pm on May 2. All art should be priced under $20. 50% of proceeds will go to the artists and 50% to Sounds to help us keep rockin’ 🙂 Event tickets are $4. For more information, please email misha@soundshv.org. Hope to see you there! For more information about Sounds, check out the website or Facebook page! Sounds is a local nonprofit organization that hosts music and art-centered events for young adults, 14 and up. We’ve been around for about a year and have had several local bands and musicians perform, as well as a couple of open mics. We encourage local artists to display and sell all kinds of art, from sketches and paintings to jewelry and other wearables, at events. Because we don’t have a permanent space, we have events in various places downtown. So far we’ve had events at Webster’s Cafe, The Attic in the State Theatre and the Fairmount Avenue Building (Delta Program) auditorium. Our long-term goal is to have a space of our own that will be open all week after school/work. This place will have a variety of spaces, including a cafe, study space, pool table and dart boards, big screen tvs, a space to jam with house instruments, group study/art project space and a flexible stage that can accommodate anything from solo performers to full-size bands. We encourage and seek out input from current and potential audience members so that we can create the kind of events they will enjoy.